Amazon is currently offering a discount coupon for the Holistic Select brand of wet cat food. The discount is valid on a 12 pack of 13 ounce cans of cat food featuring easy open lids on the cans. For adult cats, a half of a can per each 7 pounds of body weight is an appropriate feeding guideline. For kittens, they can be fed up to twice the amount of an adult cat. Flavors available include chicken, chicken liver and lamb, chicken, whitefish and herring, ocean fish and tuna, salmon and shrimp, turkey and turkey and salmon. The Holistic Select brand of cat foods is advertised as grain free. The food is also promoted as being for digestive issues and features probiotics as well as herbs and botanical ingredients which help with digestive health. This brand of cat food is made into a pate like texture and includes proteins which cats typically enjoy. The food is a good choice no matter the age of your feline friend, being appropriate for kittens, senior cats as well as adult cats. The food contains a wide variety of ingredients including proteins, fruits, and vegetables and contains added vitamins and minerals. The food is specifically formulated to help improve and maintain healthy urine in cats by reducing levels of magnesium which can contribute to urinary tract issues and diseases in cats including feline lower urinary tract disease. To take advantage of this special discount coupon, go to the Amazon product page for the food and scroll down to the section that says “Special Offers and Product Promotions”. 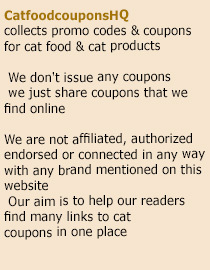 Click on the link that says “Clip this coupon” and the discount code will be placed in your cart with the cat food and when you check out the 10% discount will be taken off of your order. This entry was posted in Holistic Select. Bookmark the permalink.